There are endless possibilities with which mathematical mind twisters can be made by using only basic mathematical operations of addition, multiplication, division and subtraction. Adding some more mathematical operations add fun to these math twisters. 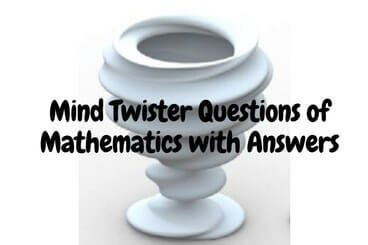 In these mind twister questions of math for the first two riddles some of the additional rules as used. However, most of the remaining math riddles can be solved with the basic knowledge of mathematics. In the following two question you can use +, -, /, x, square, square root, cube and cube roots to find the answers. Each given digit to be used only once. Q1. How will you get 6 using only digits 5, 3, 3, 3? Q2. How will you get 36 by using only digits 8, 8, 3, 3? Q4. Find 3 + 3 / 3 x 2 - 5 = ? IF WE = 28, ARE = 24 then PUZZLER = ? Q8. Find what comes next in the Series? Then 8 + 9 = ? Cube root of 8 = 2, so using cube root for both 8 we have 2x2x3x3=36. Its last digit and the next digit is the number of zeros. 2+4=6x3=18, 36x2=18 as 3+6=9x2=18, similarly 12=1+2=3x6=18.